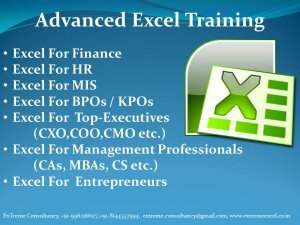 Looking for the Advanced Excel training? Then you are at the right stop. we are the freelancers provide training in advanced excel to corporate and individuals as well. • Grouping , Outlining along with Subtotals. • To work with Multiple workbooks in a single Window. • Importing and exporting data from and to various file formats. • Workbook sharing and merging various to a single work book. 6. Will you recommend us for a corporate training? Seeing believing! We are ready to provide a demo in a moment’s notice. We provide corporate it training on advanced excel, advanced powerpoint, excel vba and macros, finance modeling in New Delhi / NCR, Mumbai, Pune, Kolkata , Chennai, Bangalore, Hyderabad, Vishakhapatnam & Cochin.